There is a fine dividing line between sanity and insanity. Tiffany Morgan can’t be sure if she has stepped over that line. A mysterious driver of an SUV mows down a young woman. Accident, or deliberate hit and run, she cannot be sure. In fact, she can’t be sure about anything in her life. She awakes in the hospital, only to realize she has no memory of her former life. The contents of her wallet draw her on a journey of discovery, together with a handwritten note, signed “D” and inviting her to a meeting. What is your experience of writing short stories? I have been writing short stories for a number of years. Lunch Break Thrillers, my collection of shorts has achieved some success, both on Amazon Kindle UK and America. During a seven-month period, it hovered in the top ten for short crime thrillers, rubbing shoulders with the likes of Stephen King and Agatha Christie. I achieved some literary recognition earlier this year. I was asked to be interviewed as a guest at a University here in Brazil. It came as a shock that in the presentation, I discovered the English literature students had studied my short stories and they compared my work as a on a par with Edgar Allen Poe. What prompted you to write the story? 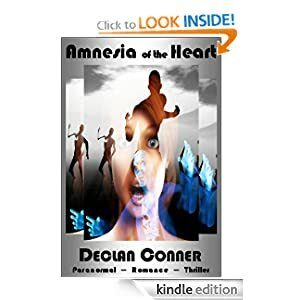 I try to be as original as possible with all my work and on deciding to write Amnesia of the Heart as a romance ghost story, I chose to take the here and now for the setting, but to take it into the realms of sci-fi fantasy, in a technological world that the reader may recognize. To say any more would be too much of a spoiler.